The men of the Long Range Desert Group (LRDG) in the Middle East in World War II did this, and more. The LRDG had been variously described as “arguably the most dashing and successful irregular formation on either side in the entire war,” and “probably one of the most cost-effective special forces in the history of warfare.” It carried out some 200 missions across a desert the size of India, then through the Mediterranean, the Balkans, and the Adriatic; in five years of existence, there were only five months when an LRDG patrol was not on an operation. The Long Range Desert Group was created, literally, by accident. A collision in a British convoy in the Mediterranean Sea forced a troopship to dock at Alexandria, Egypt, for repairs. Among those deposited there was Major Ralph Bagnold of the British Army’s Royal Engineers en route to a posting in East Africa. Bagnold was ready in just five weeks. For vehicles he chose Chevrolet trucks for their proven durability in the desert, though they got only six miles to the gallon out there. For equipment, he used a sun compass he had designed and army radios with a skip range of 1,200 miles. For his men he rejected death or glory daredevils and instead contacted old desert hands and recruited 150 New Zealanders (200 eventually served) for their toughness, even temperament, and being used to repairing trucks on their farms. 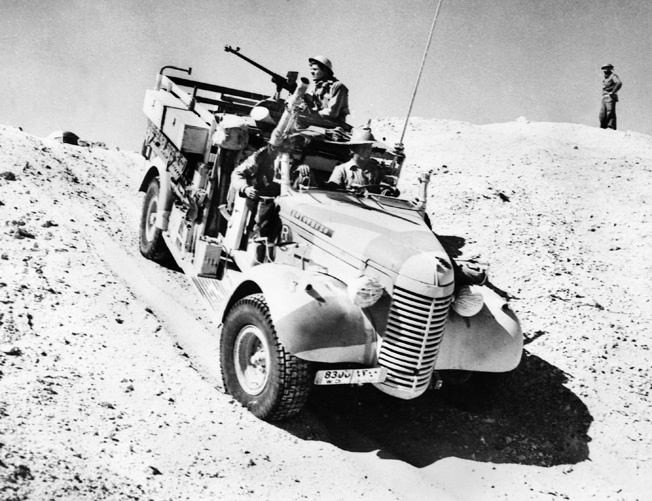 On patrol in the desert in March 1941, a truck of the Long Range Desert Group traverses a sand dune. In its first operation, in August-September 1940, the Long Range Desert Group proved its worth and routed the skeptics as two units, one led by Bagnold, crossed 4,000 miles undetected, scouted and attacked Italian outposts, survived the paralyzing heat of the day and freezing cold of the night, then successfully rendezvoused. From then on until the end of the campaign at least one LRDG unit was always out on patrol. Survival depended daily on concealment. Trucks were camouflaged with scrub or nets. Then it was found that painting the trucks rose pink and olive green made them almost invisible from the air. Patrols could simply stop at the sound of approaching aircraft and let them pass over. Survival in crisis depended on ingenuity and sheer will. A cracked crankcase was repaired with a mixture of sand and chewing gum. When patrols did come under air attack, they would drive into sandstorms and even into the dust clouds kicked up by the exploding bombs being dropped on them. Trooper R.J. Morse, wounded and separated from his patrol, walked 210 miles until he was picked up. Keeping alert to report enemy movements, a tow-man LRDG team remains concealed behind Axis lines. But the heat was as dangerous an adversary as the Germans and Italians; the men of the LRDG had to endure temperatures of 120 degrees in the shade on just six pints of water a day. “You don’t merely feel hot, you don’t merely feel tired, you feel as if every bit of energy had left you, as if your brain was thrusting its way to the top of your head and you want to lie in a stupor until the accursed sun has gone down,” an officer said. Like explorers, the men of the LRDG had to find a way or make one. One of Bagnold’s old desert hands, Captain William Kennedy Shaw, said, “You were in another world. A treeless, plantless, waterless, nameless world, almost featureless.” Progress could be as little as four miles a day, tires deflated to keep the trucks from bogging down in sand. One of the few maps the LRDG had was captured from the Italians. “The mountains were all high, as became the dignity of Fascist Italy. Making our way anxiously toward an obviously impassable range of hills, we would find we had driven over it without feeling the bump,” an LRDG officer said. The LRDG planted mines, ambushed convoys, and roared out of the night onto enemy bases and runways, machine guns blazing and blowing up fuel depots and aircraft, sometimes destroying or damaging dozens of planes in a single raid. “To the Italians, the raiders seemed to appear from nowhere, as if from a fourth dimension, and to disappear as rapidly,” wrote Bagnold. One unit had simply driven up the open road to their objective past enemy vehicles. Since the Germans and Italians utilized captured British trucks no one paid them any attention! 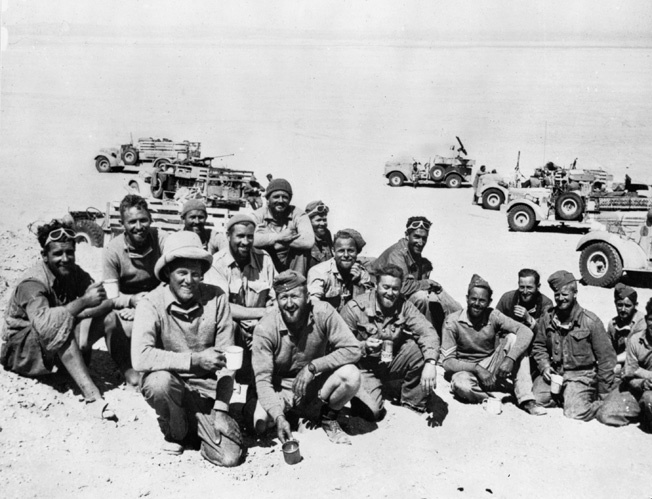 Following a successful foray behind enemy lines in the North African desert, members of the Long Range Desert Group pose for a photograph in March 1941. The LRDG also guided other forces to their objectives, rendezvoused, then brought them out. 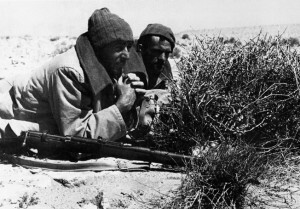 It took Free French troops over 500 miles into the central Libyan desert to capture the Koufrah Oasis in January 1941, and it worked with the Special Air Service (SAS) on many operations, including leading them 1,200 miles to raid Tobruk in September 1942. One secret group the LRDG led to its objective was composed of German Jewish refugees from Palestine in Afrika Korps uniforms along with a supposedly defecting German prisoner. The mission ended in disaster. Only one survivor reached the rendezvous to report the German POW had betrayed the mission. Driving out of the desert for the last time at the end of the Middle East campaign, an LRDG man said, “It’s like saying goodbye to an old schoolmaster, who was very severe and frightening, but whom one knew one was very fond of.” But the Long Range Desert Group’s heaviest fighting and losses lay ahead. Operating mainly as a commando unit, the LRDG went on to see action in Italy, Yugoslavia, Albania, and the Dalmatian islands. In a throwback to its surveillance role, it performed valuable coast watching as it searched for German convoys along the Aegean and Adriatic coasts; one patrol spent 17 days on the Greek island of Naxos evading a 650-man German garrison to report on German shipping in the harbor for the Royal Air Force to attack. The LRDG killed 50 Germans at a roadblock ambush in Greece, 80 at another in Albania. But while the force had lost 16 killed and 24 missing and captured in the whole Middle East campaign, it had 41 killed in a raid on the Greek island of Levitas in October 1943, and a month later Bagnold’s successor as LRDG commander, Jake Easonsmith, was killed and 50 were captured on the nearby island of Leros. With the end of the war against Nazi Germany, most of the LRDG, though eligible for demobilization, volunteered for the Pacific. However, the offer was refused and the Long Range Desert Group was disbanded in August 1945. Ralph Bagnold continued his desert research, once having an uncomfortable meeting with Count Almasy at an experts’ conference in Cairo. Bagnold lived to see the work that had been used for war put to another purpose. His study of desert sand was used by NASA in designing its Mars landing probe.